Since debuting on November 22, 2013, Microsoft's new game console Xbox One has sold 2 million units, directly stacking up against Sony's PS4 (PlayStation4). Besides acting as a fantastic game console, Xbox One, with Blu-ray/DVD combo drive, claims to be able to play DVD on it. For all that, some DVD collectors still want to rip DVD to Xbox One for playback later. Do you think their thought is nothing but bringing owls to Athens? Definitely, the answer is No. It's a common sense that DVD discs are subject to scratch and damage easily due to time-to-time putting in and out Xbox One's DVD drive. Worse yet, the commercial DVDs are always encoded with Region Code, CSS, Sony ArccOS protection, etc, preventing you from playing DVD on Xbox One smoothly as you expected. That's why the demand of ripping DVD to Xbox One is on the rise among DVD fans. Here, this article just shares you the simplest way to convert DVD to Xbox One recognized format like AVI and H264 with the help of a professional DVD to Xbox One ripper. With numerous DVD rippers for Xbox One flocking on the market, finding the most suitable one seems like looking for a needle in the hay stack. To save you from the awkward situation, MacX DVD Ripper Pro comes to give you a hand. This program is an elite DVD to Xbox One ripper that can rip DVD to Xbox One with fast speed and high quality on Mac. More stunningly, MacX DVD Ripper Pro has the mighty power to disable any copy protection measure put on DVDs in a walk, so that you can convert any copy-protected DVDs, like Big Hero, Inside Out, Deadpool and Fast and Furious, and other New movie DVD releases, to Xbox One without a hitch. Step 1: Import Source DVD. Free download, install and run this DVD to Xbox One ripper on your Mac(El Capitan incl. ), import the DVD movie you'd like to rip by clicking "DVD Disc" button . Or simply load DVD folder and ISO image by clicking the relative button on the main interface. PS: For Windows user, you can head over to the Windows DVD to Xbox One ripper (Win 10 also supported) to convert DVD to Xbox One on your PC. Step 2: Choose Output Profile. From the automatically pop-up output window, you can directly hit "Microsoft Device" --> "to Xbox Video" and choose Xbox One as the output video format. Or select "MP4" as output format. Click the "Done" to return to the main interface. Tips: If you want to edit the video, you can click the "Edit" button on the main interface to crop the video size to better suit your Xbox One's screen, extract favorite video segment, add external subtitle as you want. Step 4: Start Converting DVD to Xbox One. After finishing the steps above, click the "RUN" button to start to make a copy of DVDs to Xbox One on Mac computer. When the DVD to Xbox One conversion is finished, you can stream the ripped DVD content to Xbox One and play DVD on Xbox One freely. Or you can copy protected DVD to Mac/PC, hard drive, USB, SD Card etc. 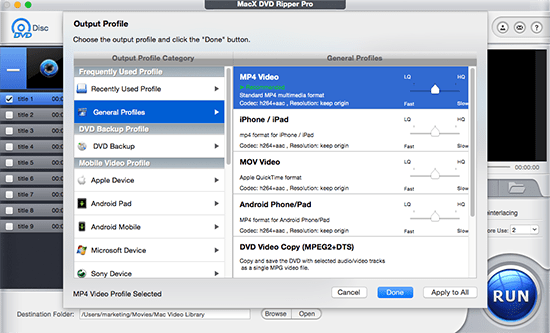 Additionally, MacX DVD Ripper Pro not only offers you the easiest solution to rip DVD to Xbox one but also enables you to convert DVD to MP4, AVI, MOV, FLV, M4V, H.264, MKV, etc for playback on iPhone X/8/7/SE/6S, iPad Air 3, iPad Mini 4, iPad Pro with Retina, HTC One, Samsung Galaxy S6/S7, etc with crisp quality. Tips for iOS users: after the DVD conversion is done, you can sync the movie file to iPhone iPad etc. running iOS 10 or below with MacX MediaTrans in a much faster and easier way. Notice: We only advocates using this best DVD ripper to rip commercial DVDs to Xbox One under the concept of Fair Use and does not encourage any illegal reproduction or distribution of copyrighted content. Please abide by the local DVD copyright law before doing it. The problem to play DVD on PS4 may let moviegoers head-scratching. So this article shares an easy solution to revolve the DVD playback problem on PS4. Simply download MacX DVD Ripper Pro to rip DVD to PS4 readable format for playback at one go. This article introduces the best DVD to Surface ripper for you to turn any DVD movies to Surface tablet format at fast speed. Just a few clicks, you can simply enjoy DVD movies on Microsoft Surface anywhere anytime. Do you want to get the best DVD ripper for Mac? Stay on the page, DVD ripper for Mac reviews compare four best Mac DVD rippers, helping you easily convert DVD to PS4, iPhone 5S/5C, Google New Nexus 7, Galaxy S4, HTC One, etc on Mac OS X with the best DVD ripper for Mac software.